While the paid attractions and activities in Waikiki are some of the best in the state, there are a variety of experiences that won't cost you a dime. The following list provides suggestions on things to do for free in and around Waikiki, Oahu. 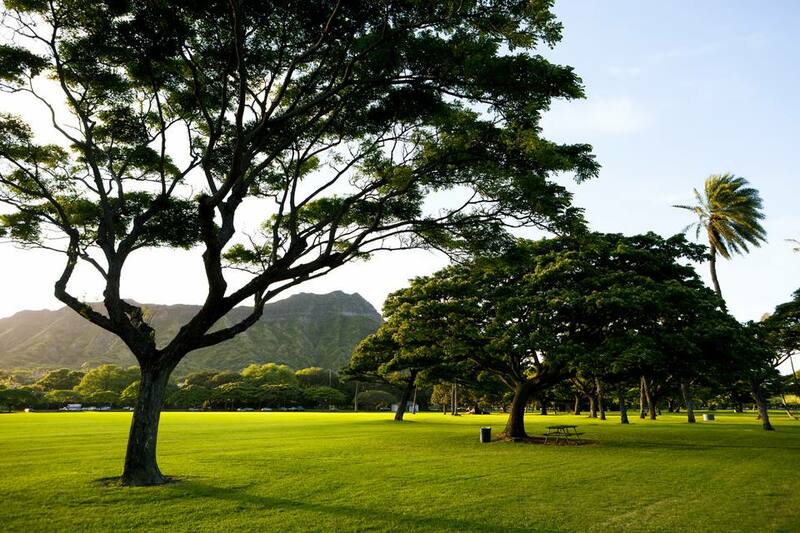 This beautiful 500-acre park, created by King David Kalakaua in the 1870s, is listed on the State's Historic Register as many of its exceptional trees are more than 100 years old. The park is host to a number of festivals throughout the year. The Kapi'olani Bandstand features a variety of free entertainment, including regular Sunday afternoon performances by the Royal Hawaiian Band. Many of the hotels and resorts in Waikiki offer complimentary cultural programs for guests where they can learn to string a lei, play the 'ukulele, or dance the hula. These experiences also extend into many children's programs as well. They help make learning about the host culture a part of the vacation experience. The Royal Hawaiian Center has an extensive schedule of free cultural activities every day of the week. Mana Hawaii a wonderful Hawaiian store on the 2nd level of Waikiki Beach Walk offers lei making classes, Hawaiian language lessons, hula lessons for children and parents too, 'ukulele classes and Hawaiian hula implements lessons, seven days a week. Hawaii is the only U.S. state with its own language, dance, and music. Most of the major hotels, resorts, and shopping centers in Waikiki feature free live entertainment by some of the island's top performers. The Kani Ka Pila Grille at the Outrigger Reef on the Beach features live Hawaiian music every night from 5:30 p.m. to 8:00 p.m. If you're an Outrigger guest you can enjoy the music for free from the lobby or pool deck. Every Friday night at 7:45 p.m., the Hilton Hawaiian Village Beach Resort & Spa puts on an amazing fireworks show on the beachfront of the hotel. While the fireworks can be seen from afar, a great place to see the show is from the Duke Kahanamoku Lagoon. Just minutes west of Waikiki are Magic Island and Ala Moana Beach Park, a beautiful 76-acre park with large, open grassy areas, and a magnificent white sand beach with gentle waters. It's an ideal spot for a picnic and recreation of all sorts, including volleyball, tennis, or a stroll around the paved bike/walking path. Almost every month, hundreds of locals and visitors gather on select Saturday and Sunday evenings at Queen's Surf Beach in Waikiki for a night of great entertainment with Sunset on the Beach. Movies from all genres are shown on a giant 30-foot screen for free. The only thing necessary to bring is a beach chair or towel to sit on. Is there actually a green flash that occurs when the sun goes down? Find out for yourself as you relax on Waikïkï Beach and watch another day in paradise come to an end. What could be more romantic? While free guided tours are no longer offered, it's easy to download and print the self-guided Waikiki Historic Trail tour text and map. You'll be walking in the footsteps of many of Hawaii's royalty and most famous residents including the famous Waikiki beachboys including Duke Kahanamoku. The U.S. Army Museum of Hawaii is located on the grounds of the Hale Koa Hotel and the Ft. DeRussy Recreation Center in Waikiki. Once a bastion built to protect Hawaii from invading forces, the structure now houses a Museum that tells the military story of Hawaii, from ancient times to the Gulf War and the War in Iraq. Each of these hostilities is covered graphically in separate displays with photographs and sound effect creating a real "you were there" experience. Admission is free, but donations are gladly accepted. One of the most beautiful expressions of Hawaiian culture is the hula. Many hotels, resorts, restaurants, and shopping malls offer free hula performances for visitors to enjoy. Both men and women carry on the tradition and tell the stories of Hawaii's past through their graceful movements. The Waikiki Hula Show features authentic Hawaiian music and hula shows by Hawaii's finest hula halau hula (dance troupes) and Hawaiian performers. Shows take place Tues-Thurs-Fri-Sat, weather-permitting at the Kuhio Beach Hula Mound, near Duke Kahanamoku statue, beachside at Uluniu & Kalakaua Ave. in Waikiki.